The normal blood pressure range of persons aged 20 – 40 years is 120mm Hg systolic pressure and 80mm Hg diastolic pressure.= 120/80mmHg. Anyone registering above this range is classed as having high blood pressure. 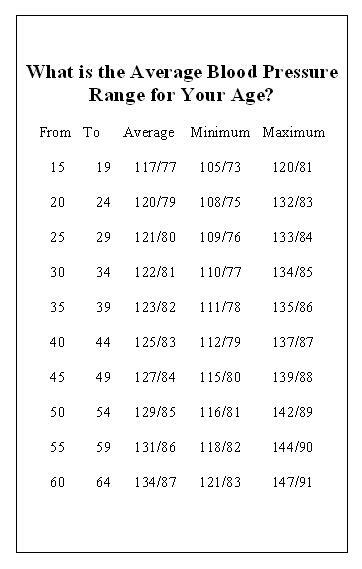 See the charts below refined averages. The Systolic pressure is when the heart`s ventricles contract and push the blood through the veins. It is called the systole, the pressure during heartbeat action. The Diastolic pressure is the lower pressure that results when air is released out of the cuff and no more sound is heard. This is called the diastole; the artery resting pressure. To learn how to use an arm cuff, monitor, stethoscope and graph, see my chart page. Or if you prefer, you can use a Digital Monitor instead, but the stethoscope is much more fun. The normal blood pressure range can vary depending on what age you are. It increases with age. For example, men normally have higher blood pressure readings than women but it depends on how healthy an individual is.When reading blood pressure, a relatively healthy person should first add 100 to their age to get rough guide of their systolic pressure. If your age is 50 then your normal blood pressure reading should be around 150. Then after taking your blood pressure, check the reading and compare it with that figure. Doing this will give you a good indication if you are over the norm or under. 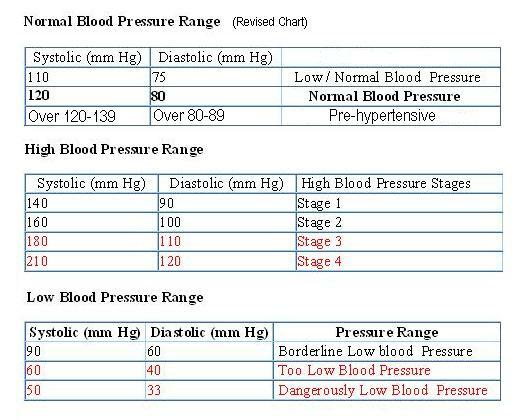 Consult the chart to the right for the average, minimum and maximum blood pressure ranges of various age groups. Because blood pressure fluctuates all through the day, taking regular blood pressure readings at the same time each day will give a more accurate reading. Preferable times to do this are as soon as you wake up before you have your first cup of tea in the morning and get dressed, and as soon as you finish work. You may very well find that your readings will be lower when you monitor your own blood pressure. But be sure to be honest with yourself. It`s your health that matters. If you are 30% over your ideal weight it will result in high blood pressure. Reducing your weight will significantly reduce your blood pressure. If young people have blood pressure it is usually secondary hypertension caused by kidney disease. When a person goes into the doctors surgery for a pressure test, the reading often is misleading as the person can be prone to “White coat hypertension”. In other words, they get nervous around doctors. When starting out on a course of supplements and lifestyle changes to reverse high blood pressure, it is good to regularly check your blood pressure to be encouraged to continue. You should see a significant drop within a few weeks toward the normal blood pressure range if you are consistent with your new routine. Try the chart out below even if you are sure you are within the normal blood pressure range, to work out if you are at risk of heart disease or not. I have kept the column on dietary fat included which is modelled from an official chart`s data, but I personally changed that column for my own use to Alkaline/Acid diet, because I believe that we need our saturated fat based on research. The result of too much acid in the blood is all too clear. High blood pressure! Choose which category you are in, and when you have finished add up your score. Compare your score to the figures below. This chart is undergoing a fresher and clearer look and will be changed soon. The information though, remains the same. 41 to 63 – very high risk. Have to seen your doctor! The abbreviations mmHg represent millimetres of mercury. The method of measuring blood pressure using a balloon connected to a mercury column or to an aneroid manometer was developed in 1876 by the Austrian physicist, von Basch. The balloon was placed over the wrist artery and pressure applied until no pulse was felt. It was at this point the reading was taken which gave the systolic pressure. Next Next post: Reduce Your Breathing Rate Reduce Your Blood Pressure!